In an age when major corporations play an increasingly powerful role in global affairs, it is essential that the private sector be called to account for its impact on the human rights of people and communities. Being conscious that National Human Rights Institutions (NHRIs) have a critical part to play in this endeavor, CESR participated in the Annual Seminar for NHRIs, which focused on the topic of Business and Human Rights, in New York recently. Organized by the United Nations Development Programme (UNDP), in partnership with the UN Office of the High Commissioner for Human Rights (OHCHR), the seminar sought to expand discourse on the relationship between human rights and business and the corresponding role of NHRIs. Framed within the global debate on the post-2015 sustainable development goals (SDGs), and in light of the third anniversary of the United Nations Guiding Principles on Business and Human Rights (Guiding Principles), the event facilitated a timely discussion on how to strengthen corporate accountability for human rights. 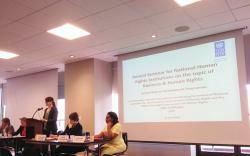 Drawing on our recent publication A Post-2015 Fiscal Revolution, Allison Corkery, Director of CESR’s Rights Claiming and Accountability Program, stressed the potential for NHRIs to play a key role in ensuring accountability for the ways that corporate activity influences states’ fiscal policy. Through their promotion and protection functions, NHRIs can for instance, advocate for greater transparency of the state’s fiscal data, as well as analyze how tax policies might enable businesses to indirectly harm economic and social rights. She also proposed a number of strategies NHRIs might employ to strengthen their capacity to advance economic and social rights. For example, forming alliances with tax inspectors and economic think-tanks could support them to undertake innovative budget and policy analyses, reinforcing their advocacy in this area. Professor Alan Miller, Chair of the Scottish National Human Rights Commission, suggested that the future success of the Guiding Principles would depend heavily on whether or not they are integrated into the post-2015 SDG framework. Their inclusion, however, will not be the end goal; it will be crucial to measure how and where the Guiding Principles generate real change in the realm of human rights and business. Although it has only been three years since Professor John Ruggie authored the Guiding Principles, the demand for quantifiable evidence of their impact is growing. If we can’t show they’re making a difference, the international community may need to consider a legally-binding treaty. A potential treaty on business and human rights was first proposed by Ecuador in August of 2013 at the Regional Forum on Business and Human Rights for Latin America and the Caribbean. The critical role of National Action Plans on Business and Human Rights (NAPs) in implementing the Guiding Principles was a dominant theme throughout the presentations and Q&A discussions. Well-designed NAPs lay the foundation for states to assess the human rights impact of business activity, as well as for comprehensive monitoring and remedies for human rights violations committed by the business sector. Nevertheless, there is still a lack of consensus on best practice for NAPs, for example the particular indicators and methods for measuring progress. In closing remarks, OHCHR highlighted the pressing need to ensure strong accountability mechanisms for the post-2015 SDGs. Voluntary reports on progress will no longer suffice; concrete reporting measures are necessary to ensure responsibility, answerability, and enforceability of human rights standards at the local and national levels, including of business. The timely event also included valuable contributions from Anita Househam, UN Global Compact Program Manager, and Lauretta Lamptey, chair of the African Network of NHRIs and Chairperson of the Ghana Commission on Human Rights and Administrative Justice. With the private sector playing an evermore influential role in social and economic policy, it is essential that NHRIs effectively address the human rights implications of this trend. CESR will continue to support the work of these key bodies as they confront this challenge.